You are here: Home / Food / July 4th Popcorn Balls – Kid Kids in the Kitchen Fun! July 4th Popcorn Balls – Kid Kids in the Kitchen Fun! 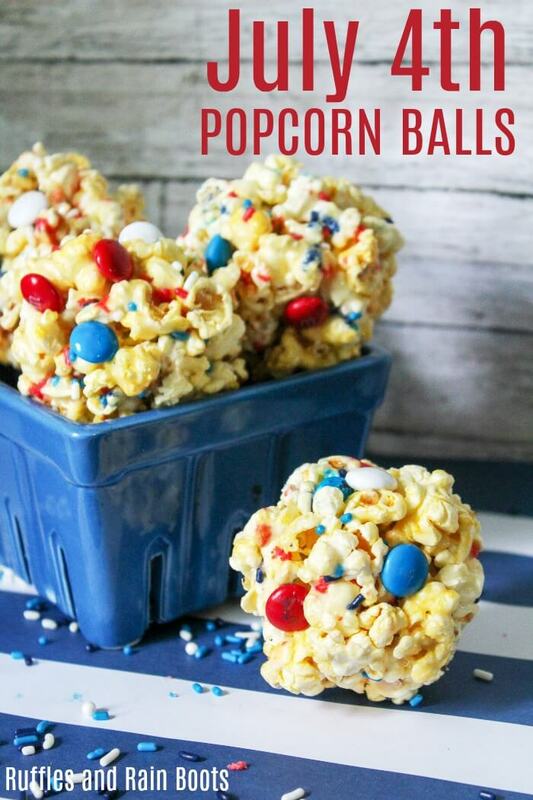 These July 4th popcorn balls are a blast to make and eat. Get the kids in the kitchen and whip up a batch of these “gone before you know it” treats for Independence Day. 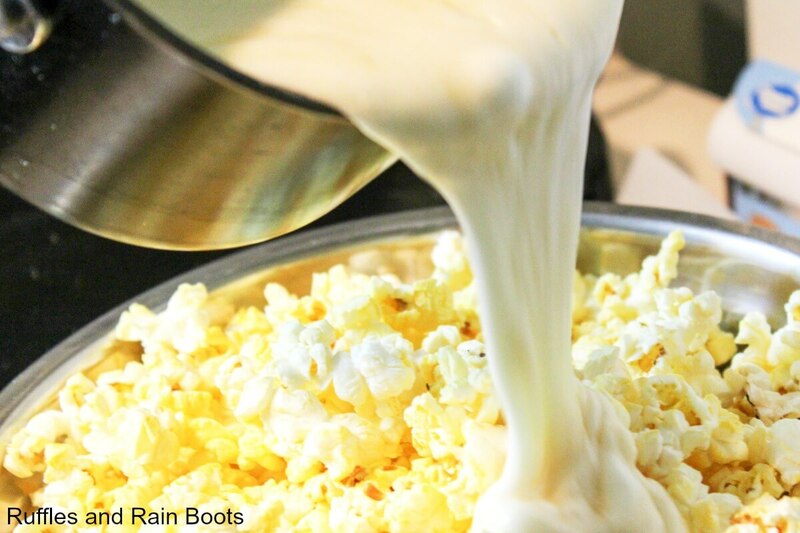 Here at Ruffles and Rain Boots, we are big fans of getting the kids in the kitchen. Not only for the learning and fun kitchen science has to offer, but also because it helps them understand the process of preparing food. 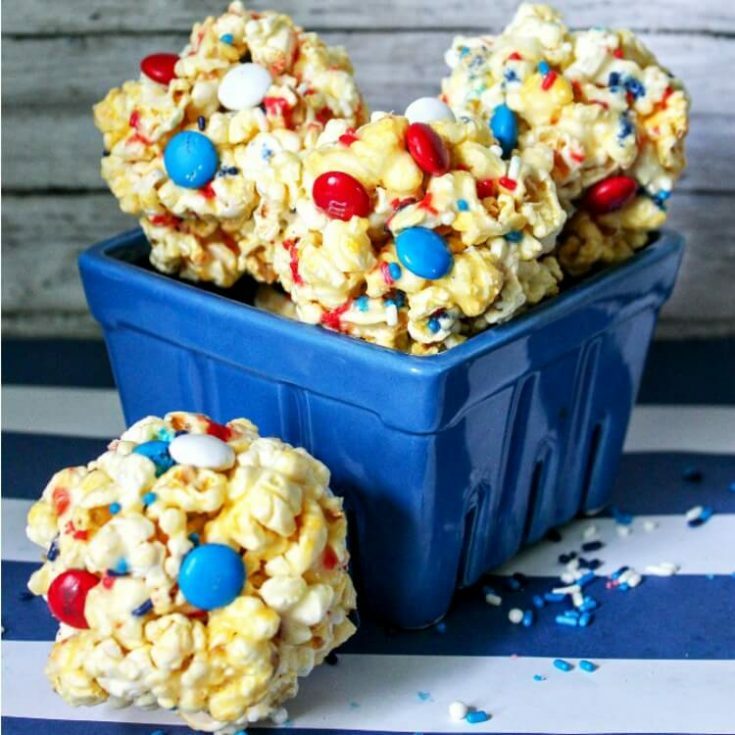 Simple recipes like this fun set of patriotic popcorn balls will keep them entertained and engaged. You’ll have fun combined with learning while they measure, mix, and watch the changes in the ingredients. July 4th Popcorn Balls - Kid Kids in the Kitchen Fun! 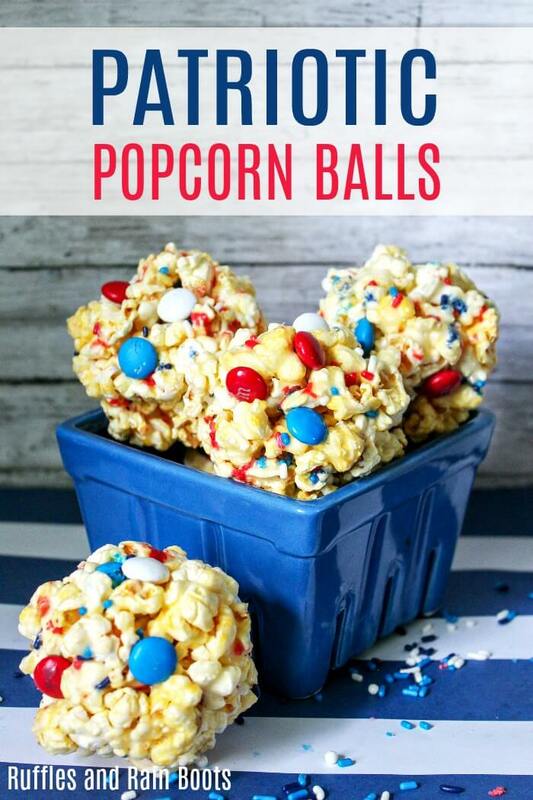 These July 4th popcorn balls are a blast to make and eat. Get the kids in the kitchen and whip up a batch of these "gone before you know it" treats for Independence Day. Pop the corn. 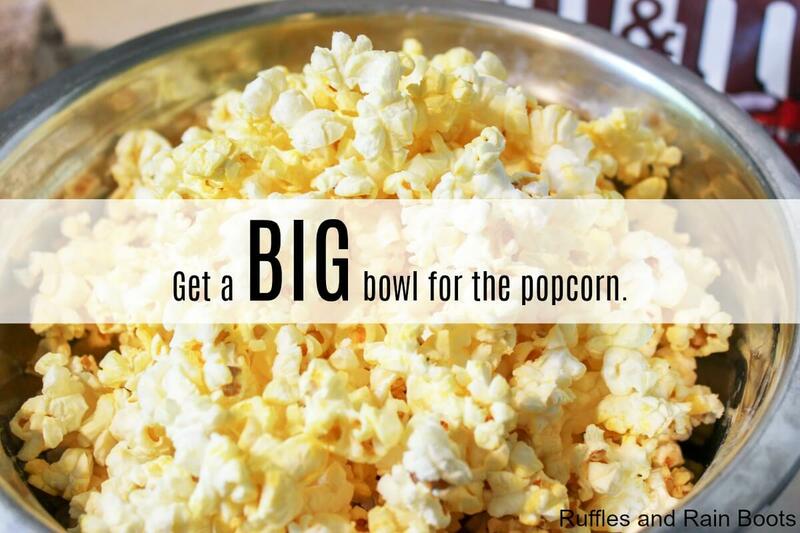 Empty the popcorn into a very large bowl (or split it between two) and remove any unpopped kernels. On the stove over low-to-medium heat, melt the butter. Once melted, stir in the vanilla. Add ALL the marshmallows, stirring until completely melted. Pour the heated mixture (adults only) over the popcorn. Add in sprinkles and M and M's and stir until your heart's content (or until it's fully incorporated). ﻿Test the temperature of the popcorn. When cool enough to handle, dampen everyone's hands with water and roll the mixture into balls. Set onto the wax paper to cool and harden. The kids will be begging you to eat 1,529 marshmallows at this point. Stay strong. 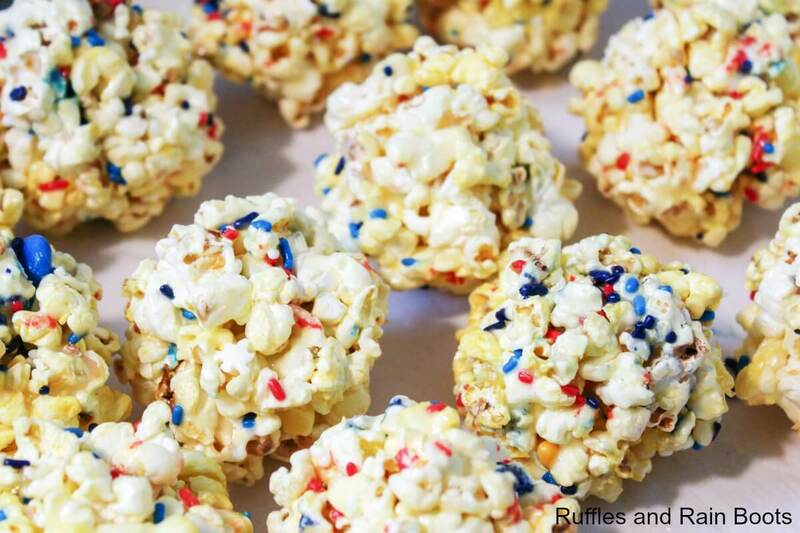 It’s time to snack on your July 4th popcorn balls! You can gift some, but let’s be honest, the kids have likely licked every single one of them by now. Give them (and yourself) permission to snack on them while lounging by the pool.